Nintendo have revealed a new upcoming direct conference centred around Super Smash Bros. for Wii U, and it’s coming very soon. Make the jump to find out the details, including dates and times for each territory! Nintendo have officially announced (via their various social outlets) that a Nintendo Direct live stream event will be happening this month, showing 50 new and never before seen, ‘must-see things’ from the highly anticipated and upcoming Super Smash Bros. for Wii U. This surely means some exclusive looks at Zelda content within the game, as the series has a large influence on Smash Bros.
Little else has been revealed about the conference (aside from the above teaser picture), and so we are left to ponder our wildest dreams until the event is live. What sort of Zelda themed items, characters or stages would you like to see? A Groosenator assist trophy, perhaps? Join the discussion in the comment section below! 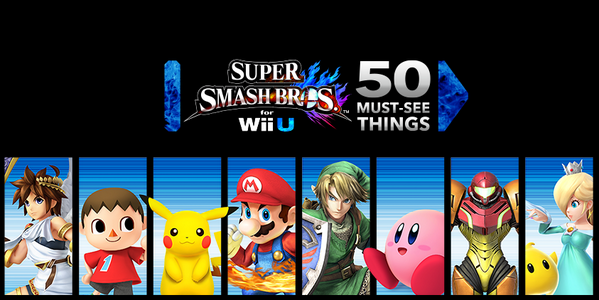 Tagged With: Nintendo Direct, Super Smash Bros Wii U, Super Smash Bros.